So far Katie has created 12 blog entries. 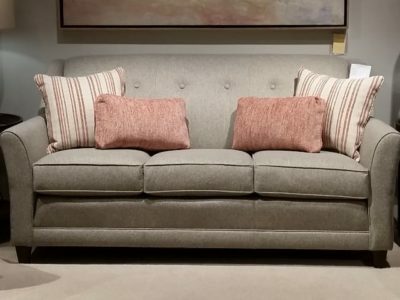 – Each sofa comes standard with 2 throw pillows in the same fabric as the sofa for this promotion. – For $30.00 more you can choose a complimentary fabric of your choice from the appropriate manufacturers fabric walls to be put on your throw pillows. – Traditional, Transitional, Contemporary, or Modern styles will be represented within these 15 different sofa frames. – Tight back, Attached Back, or Loose Back styles available. Check the frame style to see what style back is offered and if others are available. – We have chosen a variety of styles so that within the 15 frames offered for our in-house promotion, we can offer you styles that will fit your styles and choices. – The sizes are dictated by the style of the frame that is chosen. We offer high quality America made sofas at a great price here for you. It’s important to measure your space prior to placing an order. Tight doorways, narrow hallways, and stairways can potentially pose a problem when delivering new furniture. To be sure that the piece will fit in—and into—your home, follow the guide below. The last thing we want to happen is that the furniture you fell in love with, won’t make it into your home. Measure the width, height, depth, and diagonal depth. The width and height of your furniture piece should both be less than the widths and heights of the doorways and hallways in your home. *Some of our furnishings have removable legs, feet or bases, and can be delivered through a smaller space. Please confirm with our staff which products are available. If you are unsure if an item will fit or not, one of our delivery staff would be happy to come out to measure & evaluate your space to determine if the furniture you want will make it in your home.